Great white shark breaches the ocean surface (file photo). It is summer time in the southern hemisphere and locals and tourists are flocking to the coast to enjoy the sunshine, salt air and some of the best beaches this part of the world has to offer. In southern Africa it's also the time when great white sharks migrate closer to Cape Town's shore to take advantage of warmer waters and abundant fish prey. Shark bites are in fact extremely rare and there were only eight deaths annually from shark attacks between 2011 - 2015. In Cape Town, there have been 13 shark attacks - four fatal - since 2000. Interactions between sharks and humans happen in a variety of places. That means reducing conflict needs different interventions. 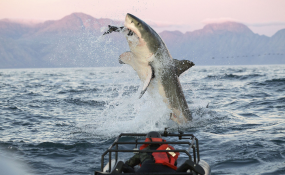 Some have included lethal shark control methods like shark hunts, shark (gill) nets or other fishing devices, aimed at targeting and killing the predators. For example, along South Africa's KwaZulu-Natal coastline a combination of shark nets and baited hooks (drumlines) are used to catch and kill large sharks close to beaches to reduce the chance of shark attacks. In 2006, following a cluster of four shark bites over a two-year period, Cape Town decided to do things differently and supported a non-lethal method - Shark Spotters. The idea was pioneered in 2004 by local surfers and lifesavers with the aim of reducing the chance of a shark attack while still conserving them. Our study argues that the warning system works. Our analysis of shark sightings and the behaviour patterns of water users like swimmers, surfers and paddlers shows that the overlap between the two is high on a seasonal and a daily basis at two of Cape Town's most popular beaches, Muizenberg and Fish Hoek. During the summer months up to 40 trained shark spotters are employed in Cape Town's pioneering shark spotting programme. They keep watch over eight of the city's most popular beaches. The programme's aim is to reduce the risk of a shark incidents without harming the sharks and the marine environment. The programme also provides research, education and job opportunities. We attribute some of this success to the Shark Spotters programme. Our findings showed that water users responded to the white flag and siren warnings that followed a shark sighting. But we also found that the red flag warning - the sign for an increased risk of a shark in the area or that a shark was spotted within the last hour - was largely ignored. This could be because people are not aware of the meaning of the red flag, or because they didn't see the flag, or that they accepted the risk.